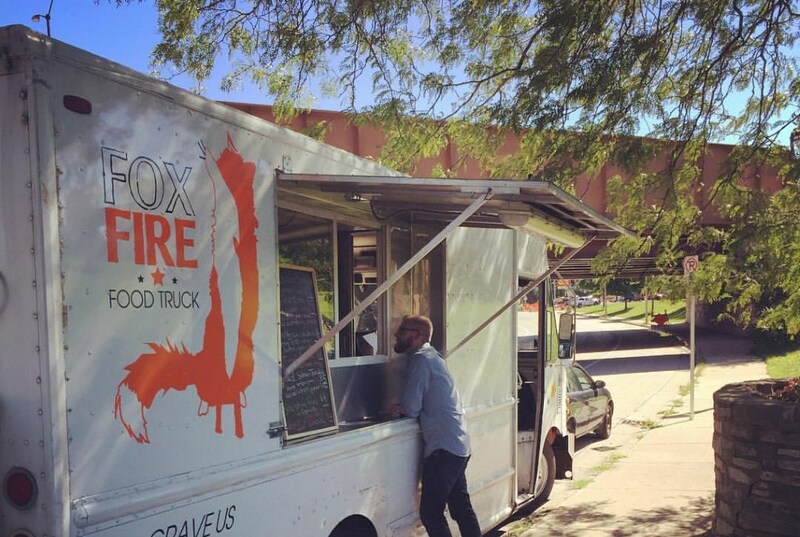 Fox Fire Food Truck. Photo from Facebook. With an emphasis on fresh and local, Fox Fire will begin by offering a rotating menu of sandwiches ($8) and sides ($3-4), including fried brussels sprouts; shoestring potatoes; Mexican corn on the cob; a banh mi made with beef short ribs; a hot buttermilk fried chicken sandwich basted in spicy bacon fat; po boys featuring fried green tomatoes and shrimp; and tortas stuffed with traditional refried beans and Oaxacan cheese along with non-traditional ingredients like meatloaf and duck confit. During the Food Truck Friday at Morgan Park, the truck offered up a number of options including a pulled pork torta, a fried chicken sandwich and a hot fried chicken sandwich (each $8). “We’d also love to offer larger format items that people could take home to feed their family for dinner or to take home for Packers games or gatherings,” says Phillips. The company offers breakfast, lunch and dinner options that cost anywhere between $11 and $18 depending on the size of the dish, as well as snacks priced from $3 to $10. Customers can expect meals like paleo sloppy joe’s, paleo chopped ranch chicken salad, pecan maple salmon and Italian vegetable lasagna through Kitchfix. Milwaukee customers can order their meals online at Kitchfix.com and then pick them up at the following hubs in the region: Monkey Bar Gymnasium in Milwaukee, Crossfit Groundworks in Glendale, Badger CrossFit in Wauwatosa, CrossFit Greendale in Greendale, The Lift Pilates in Fox Point and CrossFit Menomonee Falls in Menomonee Falls. Poke traditionally combines raw, cubed tuna with soy sauce and sesame oil or with spicy mayonnaise. At FreshFin Poke, the menu will have about a half-dozen different varieties of poke (pronounced poh-kay). The restaurant also will have options for diners to customize their bowls, with a base of white or brown rice or mixed greens, topped with tuna, salmon, shrimp, tofu or seasonal vegetables that are mixed with a choice of sauce, such as ponzu, sesame-soy or spicy ginger. Additional ingredients for the bowls could include items such as carrot, green onion, seaweed salad or avocado; some add-ons would be free, others would be an additional charge. Each bowl would be topped with crushed wonton chips or another crunchy ingredient of the diner’s choice. Bowls will be available in two sizes, expected to be 8 ounces and 16 ounces, and prices would range from about $8 to $13. For more information, go to http://www.lbwn.org/ifaw.